Even if you knew nothing about me, two things would be instantly clear- I'm not afraid of a little colour and that natural hair hues don't interest me much. I was trying to think back to the first time I dyed my hair (10th grade, when I finally wore my mom down) and realized that I've wanted any colour hair but my own (the blackest blue-black) from a pretty young age. All that said means that my hair has seen some things, been some questionable colours, and needed TLC. 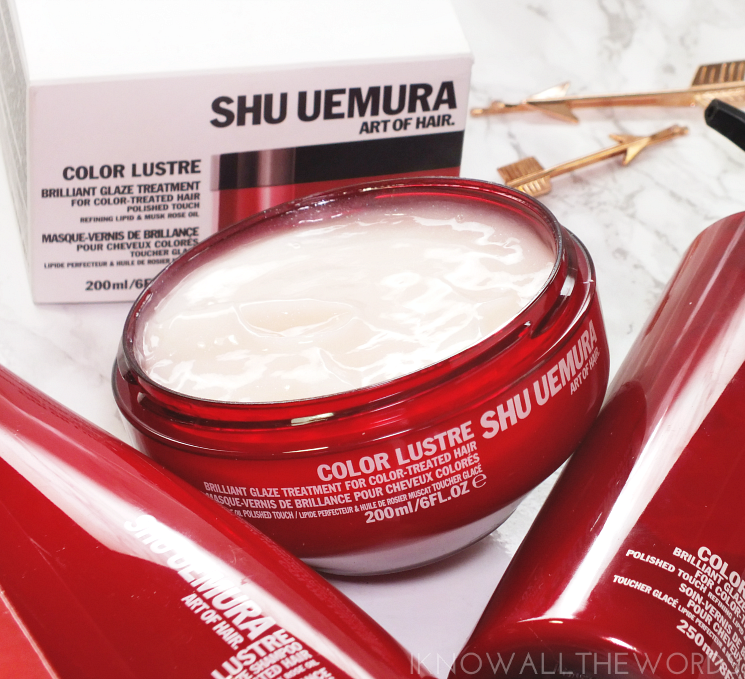 I take much better care of my hair than I once did, and recently it's the Shu Uemura Art of Hair Colour Lustre range that has been my go-to. It's just so good! 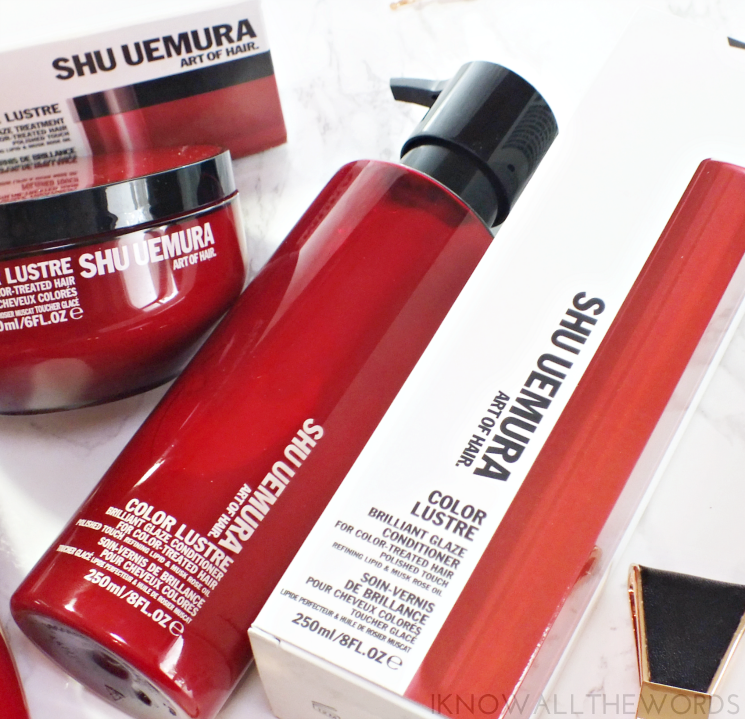 Shu Uemura takes hair care seriously. I appreciate that, as there is nothing sadder than seeing your hair colour wash down the drain. 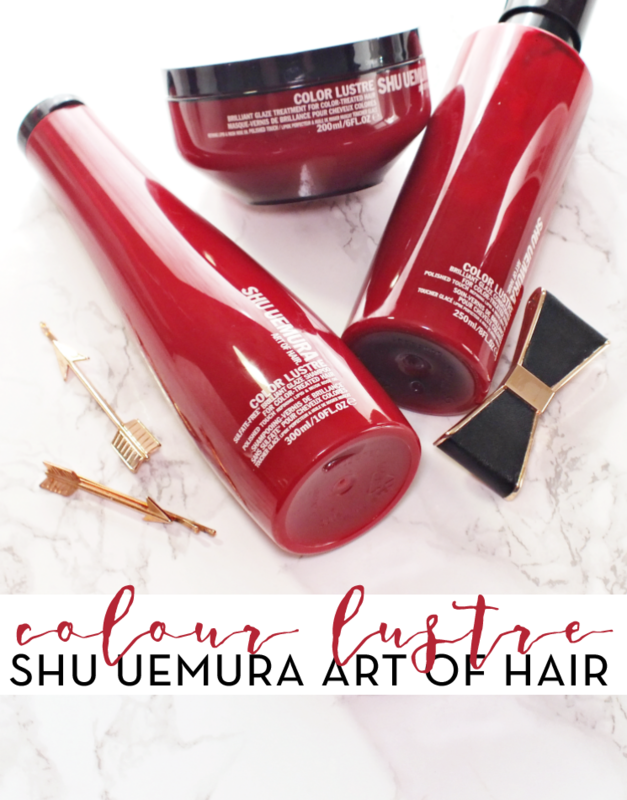 The Colur Lustre range is formulated to not only protect your colour from fading, but it also works to restore hair to it's natural shiny self. The range was also created to smell better than your average hair products, with a complex blend that is more like a fine perfume than shampoo with a Rose of Japan scent. The breakdown? Top notes of mandarin, grapefruit, black currant, and cardamom essence, middle notes of rose, freesia, and violet, and base notes of sandalwood, musk, and vanilla. Starting at the start, with the Colour Lustre Sulfate-Free Brilliant Shine Shampoo. The formula is not only sulfate-free to protect from colur fade, but it's also designed to protect hair from water. Refining lipids mimic hair's natural protective coating by insulating the cortex from water. It's ingenious especially if you're temporary dyes that can run from water alone. Enriched with musk rose (rich in fatty acids and vitamin A) and goji berry extract (protects from oxidation and colour fade) and you've got an exceptional shampoo. Words I don't think I've ever uttered typed. Side note, if you tend to miss the rich lather of traditional shampoos (those that do use sulphates) this is for you. This shampoo creates a ton of foamy lather for that extra clean feel. I tend to equate lather with clean even though it's not the case. A shampoo needs a mate, for which there is the Colour Lustre Brilliant Glaze Conditioner. This conditioner is magical in that it provides a lot of hydration and shine but is so lightweight. It utilizes the same main ingredients as the shampoo- musk rose oil, goji berry extract, and refining lipids- to preserve colour, illuminate, and add vibrancy. Prior to my haircut (I chopped about 12 inches off) I was a reverse washer (conditioner first, shampoo second) as I found it worked better on my dry but fine textured hair. Since cutting, I've been using this range in the traditional order and am perfectly happy with the results. Why? This conditioner. Its light formula doesn't weigh hair down (at all) but still gives drier hair what it needs to be in peak condition. For an added dose of hydration and shine, the Colour Lustre Brilliant Treatment is the answer. But it's more than your average deep conditioner as it also works to restore the protective varnish on hair which in turn works to preserve your colour. They seriously thought of everything with this range. Overall, I'm a major fan of this range! It's on the pricier side, but you're definitely getting quality products which protect your other investment- your colour. The range also includes a heat protectant, and dry shampoo (which I clearly need, immediately.) What do you think? 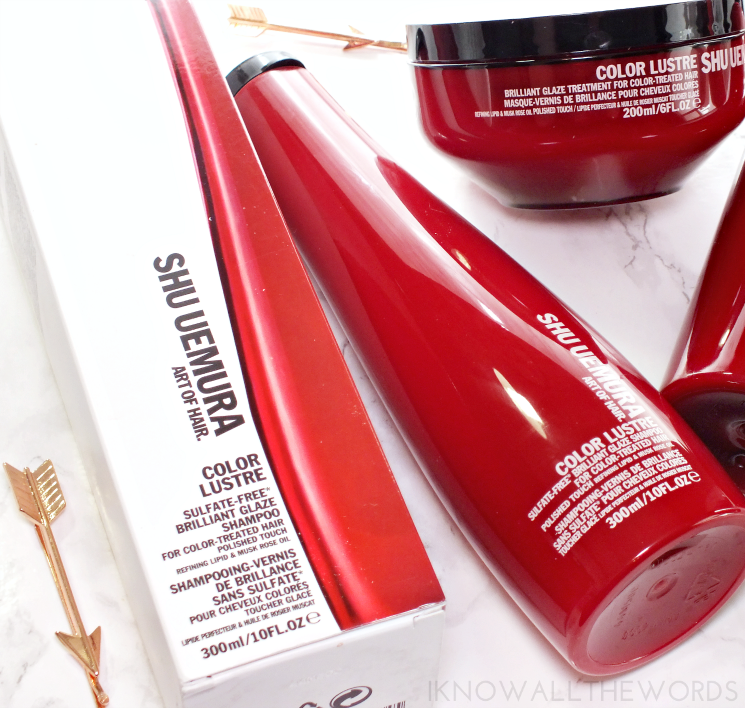 Are you on the hunt for great coulour-safe hair products? Tried these?